If you were accused of being a Christian, would there be enough evidence to convict you? This question has been asked before, but it has a valid point, because we loftily claim belief but have little evidence of said belief (I realise that I am generalising, ‘to make a point’). 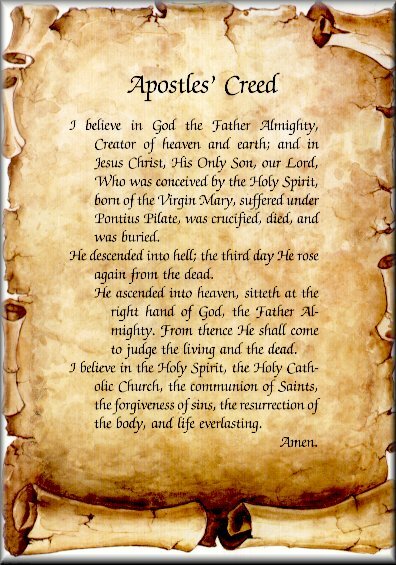 The apostle's creed is believed by many groups - most evangelicals would ascribe to its theology as would the Catholic Church. There are songs written based on this creed, or the theology of it. Yet I feel that there is a huge chasm between saying ..."We believe..." and how we act. In Spanish there is a saying which we quote a lot, "El papel aguanta lo que se le pone". It basically means ‘you can write anything on paper’. So, we can say we believe the creed, we can even make it into a nice poster, but, it is completely another thing to live it, act upon it, and reflect it. Where am I going with this? Well, recently I have been struggling with how many of us espouse to certain beliefs, might even enter into debates or arguments where we can defend these beliefs, but our lives do not support those beliefs. If I say I believe something, my actions should reflect those beliefs. Like if I were to tell you that the roof of my house was going to cave in, one would not expect to find me sitting within the walls of my house! If you did find me there, you would question my proclaimed belief. Jesus seemed to make a big deal about ‘orthopraxy’ as well as ‘orthodoxy’ (right ‘acting’ and right ‘thinking’). Ernie has often told me that if the children of Israel would have lived according to the covenant that God made with them at Sinai, they would have changed their world. But they failed to obey. If New Testament Christians would live out the instructions given in the Sermon on the Mount we would change our world. Right ‘thinking’ doesn’t change the world like right ‘acting’ does. What is our impact today? About a third of the world's population is said to be Christian (all denominations included). That is an overwhelming amount. Certainly that amount of people, 2.18 billion, should have an impact? Are our belief's life changing? Or are we all just sitting around singing "kumbaya"? Or theologising? Or debating the finer points of doctrine (armchair theology)? I often see the biggest signs of passion at a sporting event! Just look at all the passion shown when the Winnipeg Jets made the play offs! Or, great shows of emotion at a concert. Is there anything wrong with being passionate about your favourite hockey team? No. Should music not provoke emotion within me, even deep emotion? Of course. But should not the finished work of Christ evoke an even deeper passion within me? Should I not be overwhelmed by emotions, thinking of all those lost souls headed for a Christ-less eternity? I would say more so. Have we gone from ‘fire and brimstone’ preaching to lack lustre faith, in some ways? Where do we get to interact with our faith? Challenge it? Ask tough questions? Struggle through it? We tend to have monologue teaching in many Bible school classes, sermons, Sunday School, seminars, workshops and other "Christian" events. We often hear teaching in one of these places and we are no sooner in the parking lot and it is forgotten. Often times, after Sunday morning or midweek Bible study, we come away with no application whatsoever. We have not even been asked how the scripture should impact us or change us. We have not been challenged to go out and BE and DO. So what do we do about this, if anything? I think we begin where we are, by changing. First, it applies to each one personally. I want people to see that what I believe impacts how I behave. I will not water down how Scripture commands me to behave. I will not tell white lies, I will not gossip, I will not ... .... I will love my neighbour as myself, I will go the extra mile, I will forgive... ... Change must always begin in one's own life. Then, when I teach or share Christ, I will encourage doubts to be voiced, disagreements to be expressed, thoughts to be shared openly and freely, I will encourage dialogue. I will seek to develop an atmosphere that is not top down. Then I will ask the hard questions, like what does this mean to us today? How does this play out in today’s world? What is the Bible saying to me and how will it impact me in my daily life? We are about to embark on a new venture of getting together with a small group of people where we can do exactly this. Our prayer is that we will do exactly that - challenge each other to allow our beliefs to change how we live and eventually change the world in which we live.